Delivery and Return Rules - Deliver-Grocery Online (DG), 9354-2793 Québec Inc.
"We honor to send orders EVERYWHERE in CANADA"
"(not only out of our delivery zones but also out of Quebec!)" Your Postal Code is not on our list?!! If your postal code is not on the list, please Contact-Us. We may add your postal code to our delivery zones or send your items by Canada Post. Please note that this section just applies to the customers within Montreal in Quebec province of Canada. For other Canadian customers residing outside above delivery zones, particularly those who are outside Montreal, Quebec and even other provinces, the carrier will be Canada Post with related fees which will be calculated based on weight and dimensions of the parcel. Please after placing the order, be available on phone call, Text and e-mail for necessary contacts by our people who are involved with your order. The time of delivery depends on the workload of our business but generally speaking, after verification of the order and payment, it could happen even on the same day or the next day after 5:00 P.M during weekdays and weekends. We respect the limitations of our customers on delivery time and it is possible to make specific arrangements to deliver during the day particularly for customers that prefer to receive their ordered products at their offices or business locations. * Exceed weight: The max. weight of the orders is expected 30 Kg. associated with the fees mentioned in above table. If the order weighs more than 30 Kg. and it is doable by our delivery staff, for every 1.00 Kg. more than 30 Kg, $1.50 more will be charged. 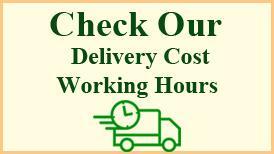 We will pick up the items that you want to returns from your address. It costs $15. But, you still can return items for FREE!! All you need is to have a new purchase with us. When our delivery team comes to deliver you your new items, you can return your old items for FREE.